WHAT IS EMERGENCY SERVICES GREATEST CHALLENGE? PUBLIC SAFETY DEPARTMENTS ARE CONSTANTLY LOOKING FOR WAYS TO ENHANCE THEIR CRITICAL RESPONSE TIME TO ROUTINE OR EMERGENCY EVENTS THAT OCCUR WITHIN THEIR JURISDICTIONS. PanicAPP SOLVES THIS PROBLEM…. 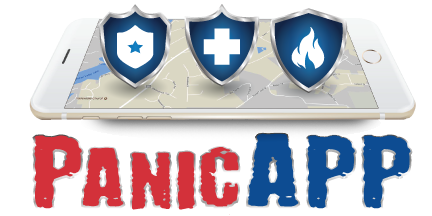 PanicAPP is a local emergency communication platform which focuses on the safety and security of local residents. We have created and designed one of the most advanced technologies for emergency services. Our focus is enhancing citizens communications with emergency services, which creates instant real time interaction with the proper authorities. PanicAPP acts as a gateway for delivering accurate and smart data from the citizens to the Public Safety departments. PanicAPP connects individuals to emergency services via live video and audio streaming. PanicAPP work from your mobile platforms, smart devices, and tablets. Our instant reporting and live dashboard helps emergency services understand the situation at immediately without going through several steps. And with our GPS tracking, the location of the person is plotted on the dashboard map and instantly alerts the dispatcher of the closest officer or emergency services person. Allowing much faster response time in real-time and provide faster support. Our live 24/7 monitoring places you in front of the proper authorities the moment you activate the panic button. Your video, audio and personal information will be provided to the dispatcher in real-time. Allowing them to send a unit instantly. Our instant video and audio streaming allows you to send communication right to the police, fire or ambulance with a click of the panic button. You are instantly in communication with the proper authority who can respond instantly. No. PanicAPP connects you with the correct emergency service immediately. When you activate the panic button your GPS location, your personal information, video and audio are instantly transmitted to the proper authority. So they know your exactly location. Through our GPS tracking locator, once you activate the panic button, your exact GPS location is transmitted to the proper authorities. And you now have instant 2-way communication with them. Will my location constantly be tracking by Police? Nothing. Your personal information is private and only displayed to the proper authorities after you have alerted them. Your information is only used so they can help you. What happens to the video transmitted? The video is displayed on the dispatcher screen and logged into your profile as the person submitting the video. Will I have phone communication with authorities? Yes. When you alert the authorities not only will your video start streaming, but you will be in constant communication with them through phone and chat. Absolutely. Privacy is a very important part of PanicAPP. Your data is protected by the most up-to-date encrypted web servers and data protection protocols.